Howdy partner! Here is TVGB’s preview of 1849! 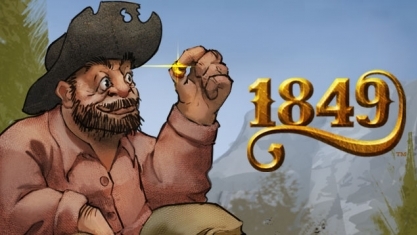 That VideoGame Blog grabbed its pickaxe and searched for gold with the preview of 1849, a gold rush themed city simulator. Set in California during the gold rush of 1849, you play as an entrepreneur coming to California seeking wealth, fame and excitement. 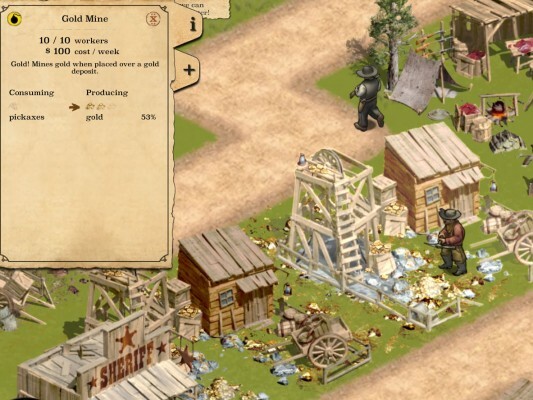 Through the use loans and financial backers, you set out in hopes of building successful mining towns and trade routes. Whether these towns fail or succeed however is up to you. In addition to building a town and attracting residents to come live and work there, you must also keep them happy, fed and well supplied with things they need. If you don’t, your town’s citizens may leave, and the lower your town’s population, the less money you have to run and manage it. When you start the game, you immediately begin to establish your first city. Controls and actions are essentially the same when compared to other city sims. You have a sidebar of various buildings and city modifications designed to help you upgrade your town and fulfill objectives. If you have the right amount of money, you build it right away by simply dragging and dropping anything you would like to build to a designated location. Establishing a business or service in 1849 provides several benefits. Not only do they attract more settlers to your town, which means more money in your pocket, they also open up trade possibilities with nearby settlements. For instance, if you open up a ranch which generates meat, you could sell your meat on the trade route for money towards other goods. A trade wagon coming to town. However, as with all city simulations, they require meticulous managing and care. If your settlers are not happy living in your town, they will leave, which causes you to lose money. Something I had trouble with when playing was supplying the businesses I relied on for trade with the materials they needed to make their goods. The establishments you create not only need supplies to continue operations but workers and money to pay them. If my town wasn’t working like a well-oiled machine (and it rarely was), I would lose profit and residents. Some of my businesses would even close down until I could pay my employees. But it’s that realism and added pressure that makes 1849 such a great and unique city simulator. The weekly cost of a gold mine. The green check marks represent completed scenarios as well as all the various settlements. Making a thriving a boomtown in 1849 was a lot of fun. And a lot of fun to look at! The graphics appear hand-drawn and provide a fresh change to what is currently on the market. I did not have any sound in my game though. Not sure if that was my computer or the beta. Regardless, I would not have minded hearing some pickaxes striking, horses galloping, or just a general city ambiance. The build of the game I got to play only had five scenarios to experience, but as you saw from the screen shot above, there’s way more city building to come. 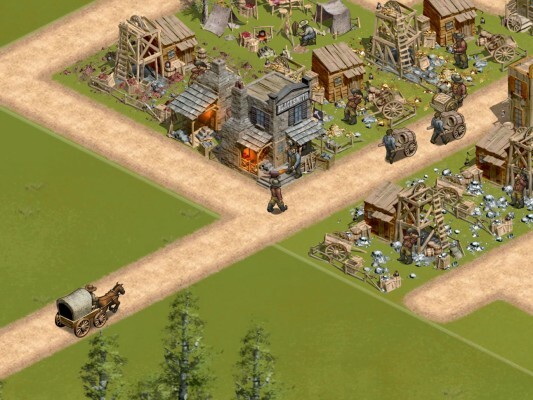 Here's an example of what a thriving boomtown looks like! Look forward striking it rich in May 2014 with the release of 1849. Can’t wait? For only $9.99 you can grab a copy of the beta that is out right now. 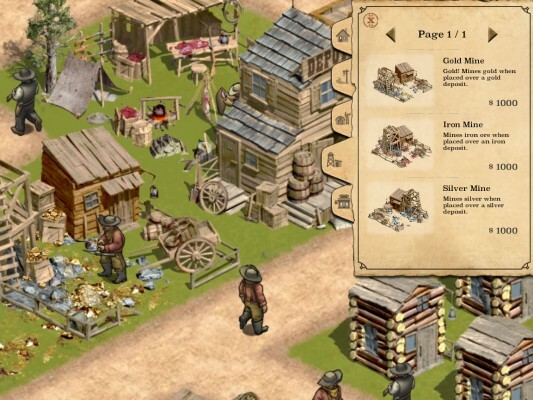 Establish a trade route, pay the gold, and download 1849 today! Go out there and make a name for yourself! To learn more, follow the trail to 1849‘s official website.